The number of studies on fitness and bodybuilding competitions is limited. Probably you will remember my previous discussions of the paper/s by Rossow, et al. ("Natural bodybuilding competition preparation and recovery: a 12-month case study." | 2013) Kistler, et al. ("Case Study: Natural Bodybuilding Contest Preparation." International Journal of Sport Nutrition and Exercise Metabolism", 2014), and Robinson et al. ("A nutrition and conditioning intervention for natural bodybuilding contest preparation: case study" | 2015). And yes, three is not just the number of studies that I've covered at the SuppVersity, it's also the number of decently recent studies dabbling with dieting down for a contest in one of the "physique sports". 5x More Than the FDA Allows! More Protein = More Liver Fat? Speaking of fitness, ... you probably already guessed it: There's study #4 by Juha J. Hulmi, et al. (2017). 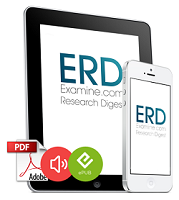 The study that was conducted by researchers from Finland and Estonia has the telling title "The Effects of Intensive Weight Reduction on Body Composition and Serum Hormones in Female Fitness Competitors" and was, as its authors point out, designed at least partly in response to the "worries about the potential negative consequences of popular fat loss regimens for aesthetic purposes in normal weight females have been surfacing in the media" (Hulmi. 2017). Since longitudinal studies investigating these kinds of diets are lacking, Hulmi et al. studied the effects of a 4-month fat-loss diet in 50 (initially) normal weight females competing in fitness sports. This means we are dealing with a large-scale observational study, not an experimental study in which parameters such as the daily or weekly caloric deficit, the protein intake or related variables were set by the researchers. Rather than that, the 27 females (27.2 ± 4.1 years | 15 newbies, 12 women who had competed before) who dieted for ~4 months, and their 23 (27.7 ± 3.7 years) peers, who were acting as weight-stable controls, managed their diet and exercise regimen as they saw fit (note: with only 3 dropouts from the diet group and 6 from the control group the adherence was pretty good). Figure 1: The experimental design of the study. Two representative participants are shown from each group. The pre to mid time period lasted ∼20 weeks during which the participants decreased their energy intake and the amount of exercise, whereas the controls maintained their activity levels and nutrient intake. 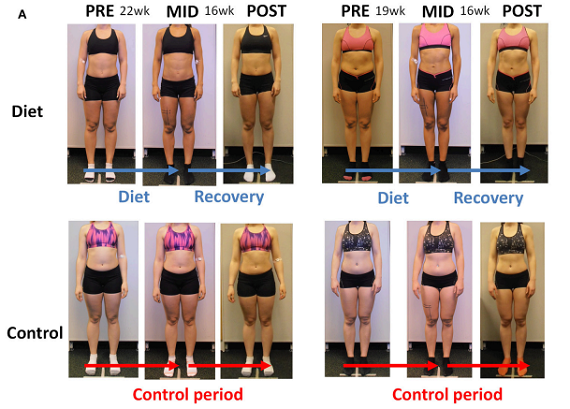 The mid to post period lasting ∼18 weeks was a recovery period with increased energy intake back toward the baseline levels in the diet participants, whereas the controls maintained their energy intake and exercise levels (Hulmi. 2017). Resistance training: Split routines were used for resistance training by all competitors in the diet group meaning that they focused on single muscle groups per session as is often the case also in bodybuilders (Hackett et al., 2013). The main muscle groups trained included thighs, hamstrings, buttocks, chest, shoulders, arms, upper and lower back, calves, and abdominals. Dividing training into separate body parts per session did not differ significantly throughout the training. At baseline the 3-, 4-, 5-, and 6-split training was used by 3, 10, 13, and 1 of the 27 participants, respectively, while the same numbers were during the diet on average 5, 8, 14, and 0 and during the recovery period 7, 8, 12, and 0. In addition, the competitors also practiced their posing routines. Training sessions lasted between 40 and 90min. Cardio: Aerobic training for the participants was almost uniquely either high-intensity interval training (HIT) with a bicycle, cross trainer or other gym equipment or both HIT and steady-state low to medium intensity aerobics (usually walking/running or with cross trainer). During the competition week the participants did not report doing HIT, but instead lower intensity aerobics. Typical HIT-exercise was 10–25 min in total including high intensity 15–45s intervals with 30–60s of recovery between the sets. Steady state lower intensity aerobics was typically 30–60 min in duration. Part of the females completed their aerobic training mainly together with their resistance exercise workouts while most of the participants completed also separate aerobic workouts, especially during the diet. As the authors point out, there was a tapering period (learn more) during which total training load is typically slightly decreased and carbohydrate and total energy intakes are increased toward the baseline levels, in the last week of the contest prep. Why would you taper before the competition? A competitor would probably answer that he, or, as in this case, she, did not "want to come in flat". Accordingly you taper, i.e. reduce the training intensity and (re-)introduce carbs into your diet to restore muscle glycogen and get rid of the "flat" look of which Hulmi et al. argue that it will "occur with low carbohydrate diets as ∼2.7g of water per each gram of glycogen is stored in skeletal muscle" (Hulmi. 2017). Speaking of the subjects' energy deficit. The latter was - as it is currently in vogue - achieved almost solely by a drastic reduction in carbohydrate intake while keeping protein intakes high and fat intakes moderate. You can see the result in form of a diet that lacked, during contest prep/dieting, ca. 20% of the habitual energy intake of the subjects in my plot in Figure 2 reduced (see Figure 6 for data on the energy balance, i.e. calories in vs. calories out from exercise = cardio + weights). Figure 2: Energy intake expressed as protein, carbohydrates and fats rel. to body weight (g/kg | Hulmi. 2017). With these dietary changes and the increase in aerobic exercises aka "cardio", the subjects achieved body fat reductions of ~12% and a ∼35–50% decrease in fat mass (DXA, bioimpedance, skinfolds, P < 0.001) during the dieting phase. Table 1: Tabular overview of the exercise levels in the diet and control groups; learn more about METs (Hulmi. 2017). as part of the previously hinted at split design. That allowed for 4.9 ± 2.9 extra cardio sessions per week (that's an increase of +27% | P < 0.05) that came mostly from an increased amount of steady state aerobics "in several subjects" (I interpret this as "the majority increased the steady-state, only a few the HIIT volume). During the recovery period, the subjects' cardio frequency dropped down to 2.3 ± 1.9 times per week - both, cardio and resistance training were yet never skipped completely. 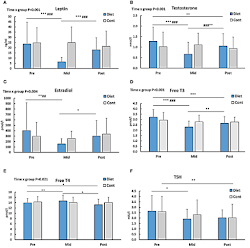 Figure 4: Changes in hormone levels; surprisingly, the cortisol levels (not shown) did not change - not even non-significantly at any time-point; *–*** is significant (p < 0.05–< 0.001) difference to Pre and #–### is significant (p < 0.05–< 0.001) difference between the groups in the change (Hulmi. 2017). Whether or not the small reduction of T3 is enough to produce what people refer to as "metabolic damage" is not clear. On the one hand, the small reduction in fT3 you can also see in Figure 5, would suggest that at least some of the subjects' (N=1...27) metabolisms were running slower than before. 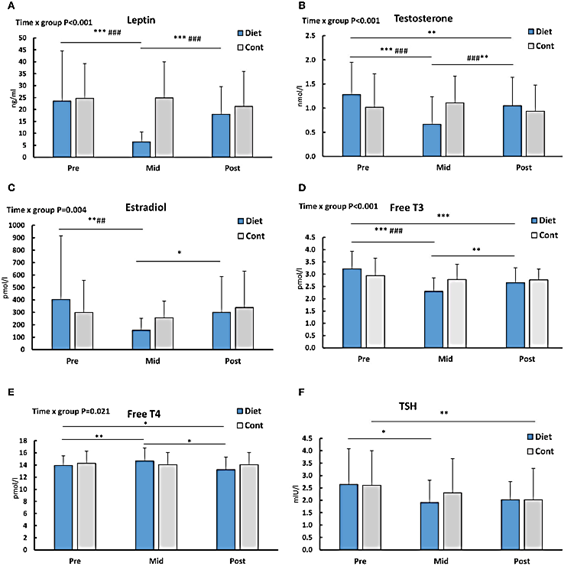 Figure 5: Active thyroid hormone (fT3) concentration at baseline (pre), before the contest (mid) and after recovery (post). The number at the x-axis depicts participant numbers ordered based on the pre-value (Hulmi. 2017). On the other hand, the subjects' body weight did not yo-yo back up to levels sign. above those they had before the contest, one may assume that this was not the case. After all, all women ate just as much as before the contest and did even less, not more cardio. This, in turn, translates into a 16% increase in their energy balance in the recovery (vs. baseline, see Figure 6) phase. Now, the question is: What can we learn from this study? If you're looking for information about the "best contest prep diet" or the "ideal workout, volume or intensity for your contest prep training", you will be disappointed to hear that a study with a single dieting group that did not even intend to compare different approaches to contest prep cannot help you to answer these unquestionably important questions (note: since "best" is always individual, I'd say you cannot answer them with certainty, anyway). 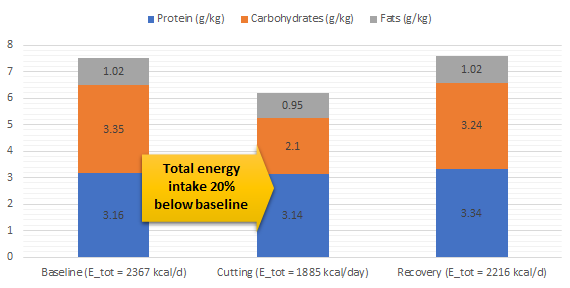 Figure 6: It is important to note that the subjects' energy balance was 16% above baseline during the recovery phase when the difference between their energy intake and total ex. induced expenditure was 1471.82 kcal (vs. 1209.60 kcal at baseline). 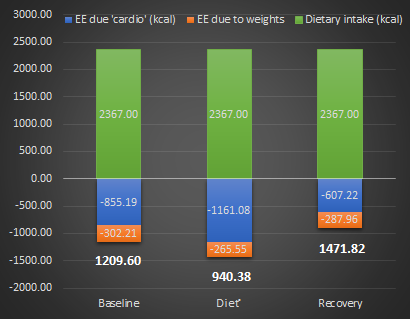 And still, they did not become fatter, but simply returned to their previous body fat levels; the figures beneath the bars indicate the daily energy balance calculated based on data from Hulmi et al by subtracting the exercise-induced energy-expenditure (cardio + weights) from the dietary intake(s). What the study can tell us - and that's, when all is said and done, eventually even more important - are that (a) using a relatively large caloric deficit (-22.5% as calculated for Figure 6) women can shed up to 50% body fat without losing sign. 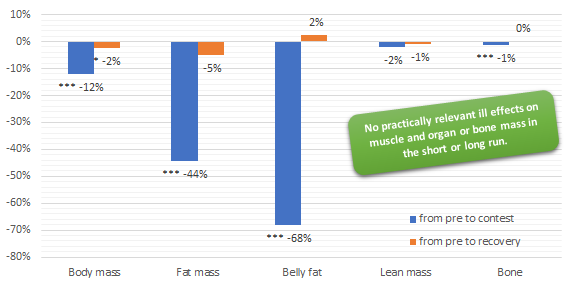 amounts of lean mass if they force their bodies to keep the muscle by strength training and fuel the protein synthesis that's responsible for conservation of muscle tissue with adequate protein intakes (previous studies on starvation diets show lean mass decreases of 6-28% | Keys. 1950; Dulloo. 1996); (b) the endocrine changes in form of reduced leptin, estradiol, testosterone and T3 levels, as well as the regularity of your menses will recover without medical intervention (albeit with a delay for fT3 and testosterone in some, but not all subjects); (c) there's no classic yo-yo effect which would imply a body fat super compensation during the recovery phase (otherwise the women would have ended up with more fat than before the competition), when the restoration of a pre-contest energy content and the concomitant decline of the subjects' exercise-induced energy expenditure in response to the reduced volume of 'cardio' (ca. 36%) | Comment! Dulloo, Abdul G., J. Jacquet, and Lucien Girardier. "Autoregulation of body composition during weight recovery in human: the Minnesota Experiment revisited." International journal of obesity and related metabolic disorders: journal of the International Association for the Study of Obesity 20.5 (1996): 393-405. Hulmi, Juha J., et al. "The effects of intensive weight reduction on body composition and serum hormones in female fitness competitors." Frontiers in Physiology 7 (2017): 689. Keys, Ancel, et al. "The biology of human starvation. (2 vols)." (1950).